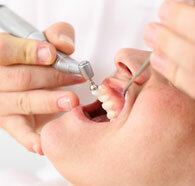 Laser Therapy is commonly referred to as Laser Assisted Periodontal Therapy (LAPT). The diode laser that performs LAPT is an important and extremely effective therapy used by Bright Smile Dental and Orthodontic Center to treat periodontal or gum disease through the process of regeneration (tissue regrowth) rather than resection (cutting). The diode laser can specifically target unhealthy “gingival” tissues in your mouth that constitute gum disease. The treatment works by harnessing the laser’s energy and conducting it through a very thin fiber that can effortlessly access infected, periodontal pockets and deliver instant treatment. Due to the tremendous accuracy of the laser, the connective tissue is spared and healing or regeneration can occur rather than the formation of a pocket seal. Stimulation of existing stem cells permits the formation of new root surface coating (cementum) and new connective tissue (periodontal ligament) formation (collagen) on tooth roots. The paradigm of periodontal healing in the absence of guided tissue regeneration barriers (GTR) or bone grafting materials (allografts) has finally been successfully challenged in the twenty first century. Because periodontal disease or gum disease is a chronic inflammatory disease caused by a bacterial infection and can lead to, or be an indicator of more serious diseases such as cardiovascular and other autoimmune diseases, the detoxifying effect of laser treatment is most valuable in treating the patient. According to most studies, there are no signs of thermal side effects in any of the patients treated. Most all studies have specifically indicated no adverse tissue events thereby demonstrating the safety of the diode laser. The diode lasers very effective bactericidal action on periodontal pathogens makes the adjunctive use of antibiotics sometimes unnecessary. This eliminates the problem of bacterial resistance and systemic side effects engendered by antibiotic use. The laser is safe and effective treatment. The fear of treating periodontal or gum disease is quickly dissolved when the patient realizes there are no scalpels or sutures involved. As mentioned in previous, LAPT is patient friendly…offering a treatment plan that gets the patient healthy without anxiety, discomfort or dread. Wounds heal faster and tissues can be regenerated (regrown).